Jewish Family Service has a busy schedule this Chanukah. The first big event is on Nov. 29, when Muhlenberg Hillel will bake cookies for Chanukah-themed goody bags, complete with gelt, dreidels, and cards. 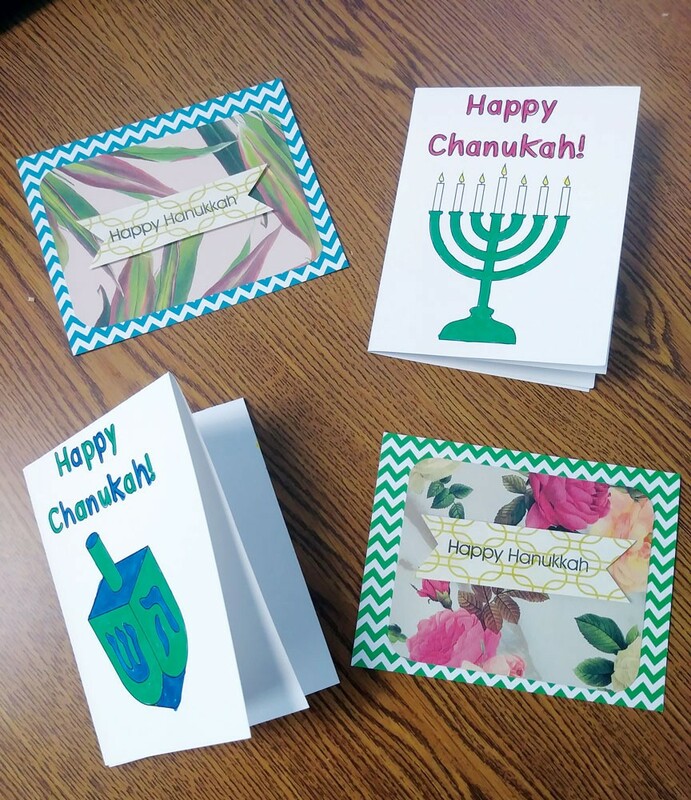 Some of the cards were decorated by volunteers and local children, and 20 were beautifully handmade by volunteer Rachel Shurman. The bags will be delivered to over 60 older adults in the Lehigh Valley. In addition to these projects with youth, there will also be outreach to older adults across the Valley. Cantor Ellen Sussman and Susan Wolfson will lead a celebration at Country Meadows on Dec. 3, including a traditional Chanukah meal of brisket, latkes, and chicken soup with matzah balls. On Dec. 4, Karp and Eva Derby will travel to both Kirkland Village and Atria to eat latkes and doughnuts with the residents. Derby will talk about the true miracle of Chanukah and where the tradition of the dreidel game came from. The same day, Leon Zoller will visit the residents of Cedarbrook. A visit will also be made by Rabbi Moshe Re’em to Phoebe, and Rabbi Allen Juda and JFS 8ish Over 80ish honoree Doris Lifland have organized a Chanukah program for the residents of Moravian Hall Square. Roosevelt Elementary School in Allentown is hosting over 300 students and family members for a global showcase of holidays called “Christmas Around the World” on Dec. 5. Each classroom will feature a different country, and community shlicha Rotem Bar will represent Israel and teach the attendees about Chanukah. Rounding out the extensive programming JFS has organized are two special events on Dec. 7. Karp will host Tikvah House Chanukah Shabbat at her home, and the Jewish Day School choir will perform their annual concert at B’nai B’rith. “It was standing room only last year,” Karp said of the concert. “The residents loved watching the children perform.” Overall, JFS is aiming to make Chanukah a little brighter across the Lehigh Valley this year.